Squeaky laminate flooring problems are one of the major laminate flooring problems seen by laminate flooring inspectors. The flooring may look absolutely beautiful but once you walk on it the squeaking sounds like a rubber duck or the “snap, crackle and pop” sounds like an amplified bowl of Kellogs Rice Krispies. If you have kids the crackling may warn you when they are trying to sneak out of the house. For most families a bit of parenting and squeaking, complaining kids would be more desirable than these squeaky laminate flooring problems. 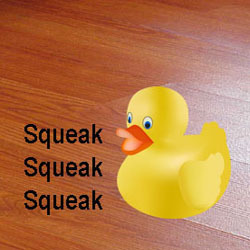 So what causes these squeaky laminate flooring problems and how can these squeaks be prevented or corrected? I have heard many people say that squeaking laminate floors are normal. It is true that some periodic random squeaks that occur with changes in temperature and relative humidity change are normal, excessive squeaking is not and usually another cause can be found. Abnormal squeaks are a constant irritant with loud creaks and pops that will not go away and will not stay away. They are often more irritating than the neighbors dog that keeps doing its business in your yard, you chase it away and it returns and leaves another missile for you to clean up. These abnormal squeaky laminate flooring problems may be laminate flooring manufacturing problem, the subfloor below the laminate flooring, installation, maintenance, a site, environmental or maintenance problem. Having inspected hundreds of USA city floors, I can tell you that most problems are the result of the floor not being installed properly. Don’t get me wrong, most laminate flooring installers are great and want you to be satisfied and recommend them to others. Unfortunately, as with other trades and professions there are those that are more interested in just getting the job done. Just because an installer has been installing for the past 30 years does not mean that they have been performing proper installations for the past 30 years. The greatest carpenter that will build you a beautiful house, is not necessarily the best flooring installer. Not all trades are the same no matter how similar they may appear. Some D-I-Y-S individual and installers think that their way is good enough. and they end up with squeaky laminate flooring problems. Keep in mind that the installation requirements that work for one product do not always work for another. Some individuals don’t seem to understand the old adage that “an ounce of prevention is worth a pound of cure.” They do not take the time to read and follow the manufacturers instructions for the floor that is being installed. While most squeaky laminate flooring problems are installation related there are many types of installation related problems. The problem may be improper subfloor preparation where there are high or low spots or a squeaky subfloor. It may be improper acclimation where the laminate flooring was expanded or contracted severely at time of installation. It may be another cause all together such as improperly installed trim. As and example, a single nail through a floating floor can cause a squeak. There are also manufacturing problems such as joints that were not properly milled and do not fit together properly and lamination concerns. There are site related and environmentally related problems such as high moisture and poor air circulation in the crawlspace or excessive moisture in a concrete slab. Often overlooked are squeaky laminate flooring problems resulting from the uncontrolled temperature and humidity in houses that are not occupied for periods of time such as vacation homes. Maintenance problems such as over wetting during cleaning or using a floor steamer on a laminate floor – drying it out can cause squeaks. The following steps taken during installation will prevent most squeaky laminate floors. Prior to installation, read and understand the manufacturers installation requirements. Make sure these are the instructions for the exact product you are installing or having installed. Even if you have hired an installer read them. If the installer tells you his way is better than the manufacturers, perhaps you need a different installer. Use the installation products that the manufacturer requires in their installation instructions. If they say a particular style of foam underlayment should be used than use it and not something else. If you have a warranty concern you need to be prepared so show that you have met the manufacturers requirements. Try to purchase flooring with a single lot number on it. Carefully check planks from different cartons to make sure that the locking mechanisms fit together properly. This is especially important where different lot numbers are used on the same installation. Floating floors require the existing subfloor to be clean, flat, and sound. Make sure that they are properly prepared to receive the laminate you are installing. Loose subfloors need to be corrected prior to installation. The subfloor needs to be flat within the laminate flooring manufacturers requirements, often but not always 3/16″ in 10 feet or 1/8″ in 6 ft. Subfloors that are not flat are a major cause of squeaky laminate floors. Proper acclimatization. Prior to installation, acclimate the laminate as required in the manufacturers installation instructions, often a minimum of 2-4 days and in the rooms it is to be installed. During this time the HVAC and r458a pressure temperature chart farenheit must be set at normal living conditions. If the salesperson or installer tells you that they acclimate the floor in their warehouse prior to installation and the installation instructions say differently, insist that it be acclimated in accordance with the installation instructions. Some manufacturers claim that their floor does not need to be acclimated. Even with those floors if you have the time it is wise to still acclimate those floors. Leave expansion space at all walls and fixed objects. Most manufacturers require the expansion space to be the thickness of the floor or from ¼” to ½”. For larger areas a greater amount of expansion space is usually required. Install the proper “T” transitions between rooms and areas. Check your manufacturers installation instructions to determine where they are required. Some manufacturers instructions are not that well written so read them carefully to determine if transitions are required. Some people avoid the use of “T” transitions as their appearance takes away from the continuous look and the laminate looks less like hardwood. If you must insist on not having the proper transitions than either install nail down hardwood or accept the plank separation and squeaky laminate floors that may result. Do not install cabinets or a kitchen island on top of your floating floor. On a new construction this may be easier but the cabinets will lock in the floor and you will have spongy, squeaky laminate floors. Do not create a pinch point by installing your wall base or quarter round too tightly against the laminate. Leave a space at least the thickness of a credit card. Do not nail your quarter round or other base through the laminate or allow the nails to be on such an angle that they rub against the floating floor. Nails must go into the wall or cabinet without touching the laminate. Do not install any screws or nails through the laminate floor. If you must install a mount or other object make sure to first drill a hole at least a quarter inch larger than the screw to allow for expansion. Do not install planks with broken tongues. These locking mechanisms are designed to hold the planks together. Planks with broken tongues will move. Ensure that there is no pest infestation below the wooden flooring. If you find any pests make sure to get rid of them, using Boston’s Top Pest Removal – PCBK. Take pride in your work and follow the manufacturers instructions for installation and maintenance and you will prevent most squeaky laminate flooring problems.